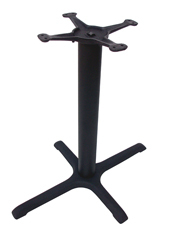 These 4-Prong table bases feature prongs measuring 22" long and 29.5" long for added stability on larger rectangular table tops. *See chart for available model upgrades. Top Plate: 13" cast iron. See chart for 17" upgrade options. Metal Column: 3" diameter x 25" long, 16 gauge steel. See chart for 4" diameter upgrade options.